Back to Homeschool With Sandbox to Socrates: News and a Giveaway! Have you made your curriculum choices, shopped for school supplies, planned your extra-curriculars, and stocked up on chocolate for Mom? For those of us following a traditional school year calendar, it’s Back to Homeschool Time! Here at StS, we’re kicking off the school year with some new features and a giveaway! Firstly, we hope you like our new LOOK! Our logo was created by our Photo Editor, Apryl Herrell. We are all so pleased, and so thankful that Apryl shared her talent and created the perfect design for StS. Secondly, we have a new FORUM! Sometimes it’s hard to chat on a blog, but we do want to hear from our readers and get to know you, so we created a new home here at StS for those conversations. We envision a friendly, intimate community where we can all help each other in StS’s sleeves-rolled-up style, sharing experiences and discussing everything from preschool nursery rhymes and naptimes to college admissions processes for homeschooled teens. All are invited to this inclusive gathering of parents who have one thing in common: We are classically educating our children at home. or would they enjoy announcing to the world that they will be able to outrun zombies if it ever comes to that? If you’d like to support StS, please have a look at our CafePress store. Our art department frequently adds new designs so check back often, and of course anything can be ordered with StS’s original new logo. Finally, we have a GIVEAWAY! One lucky winner will receive this travel mug from our store, because homeschooling parents spend a lot of time driving, and because most homeschools are fueled by coffee. You need this travel mug. CLICK HERE TO ENTER! 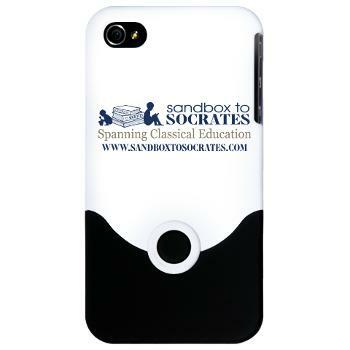 Thank you for reading here at Sandbox to Socrates. We have great plans for the future as we try to encourage you as you homeschool your children! Please join us on our forums, and don’t forget to enter the giveaway! I love the new look and everything in the store! Love the logo! Love the art! So cute!! Thank you so much for the giveaway!